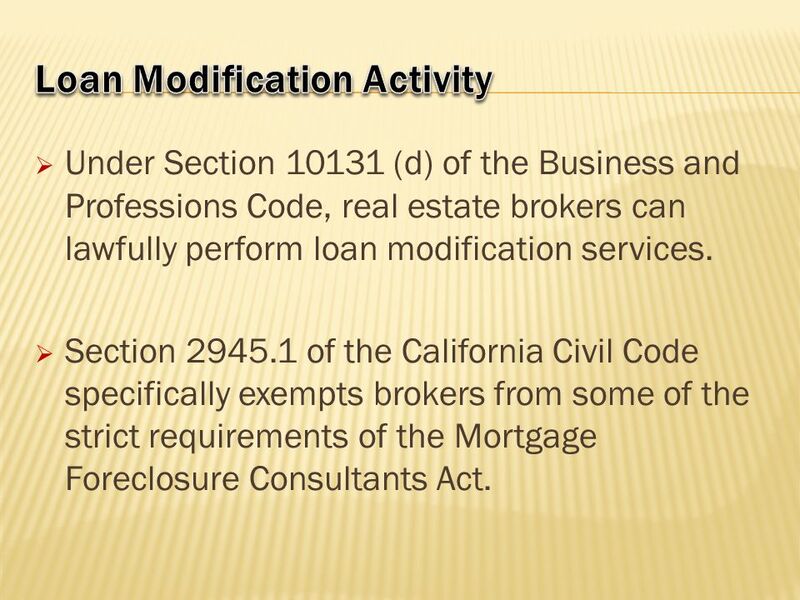 Under Section (d) of the Business and Professions Code, real estate brokers can lawfully perform loan modification services. 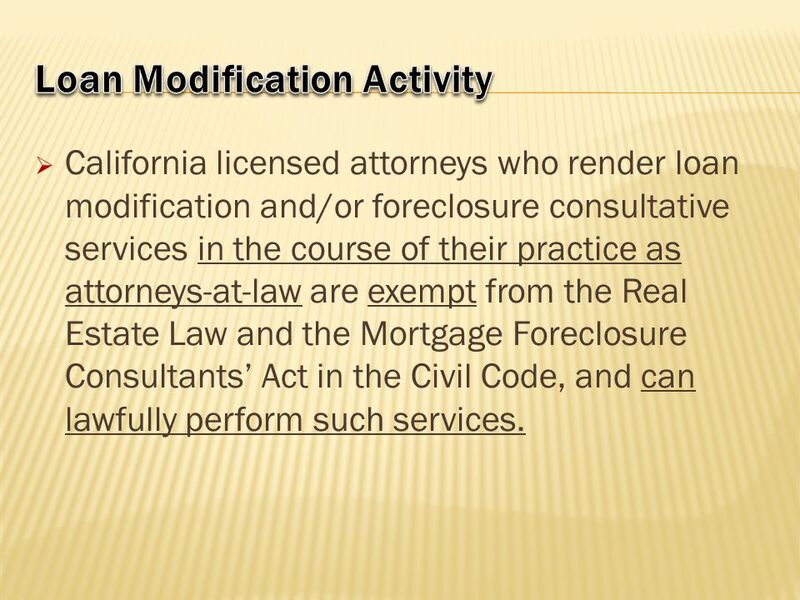 Section of the California Civil Code specifically exempts brokers from some of the strict requirements of the Mortgage Foreclosure Consultants Act. 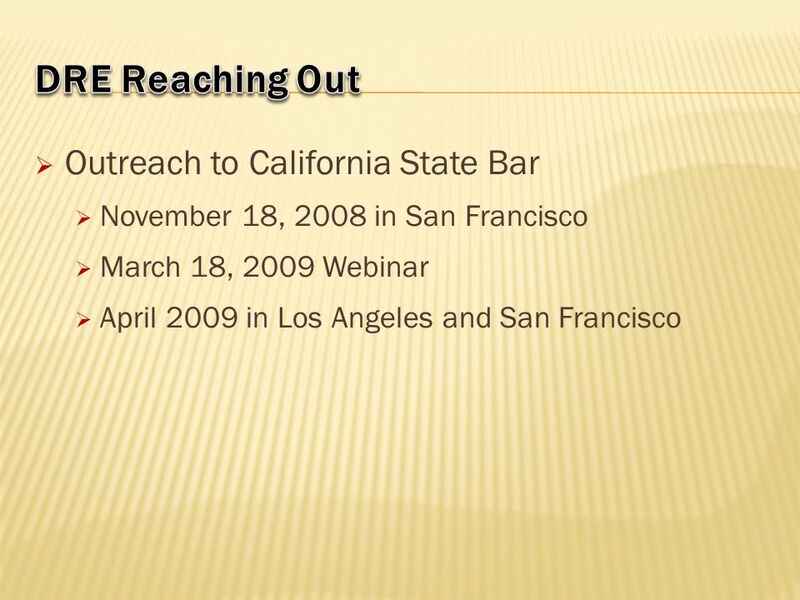 California licensed attorneys who render loan modification and/or foreclosure consultative services in the course of their practice as attorneys-at-law are exempt from the Real Estate Law and the Mortgage Foreclosure Consultants’ Act in the Civil Code, and can lawfully perform such services. 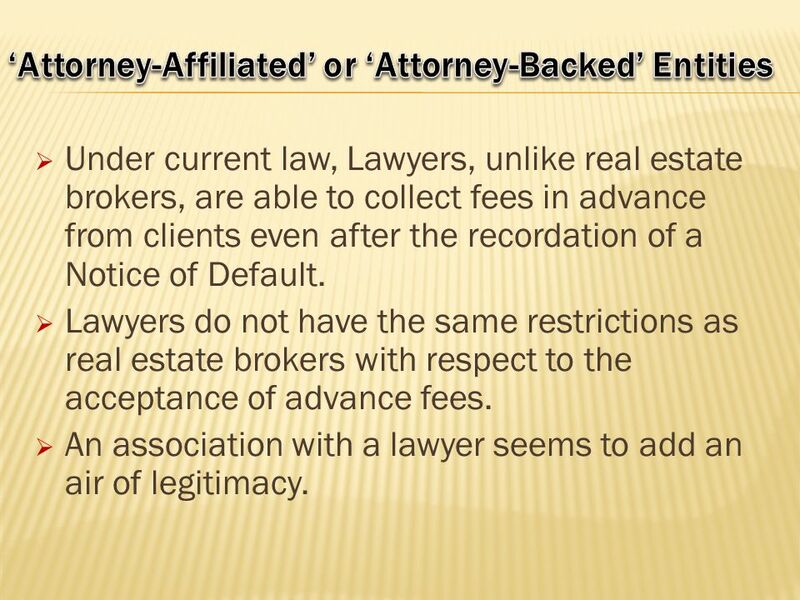 Under current law, Lawyers, unlike real estate brokers, are able to collect fees in advance from clients even after the recordation of a Notice of Default. 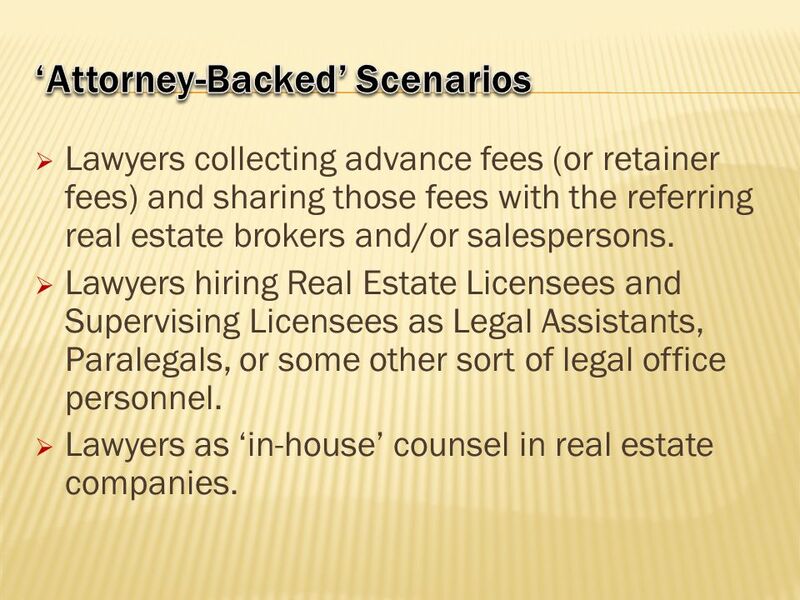 Lawyers do not have the same restrictions as real estate brokers with respect to the acceptance of advance fees. An association with a lawyer seems to add an air of legitimacy. Lawyers collecting advance fees (or retainer fees) and sharing those fees with the referring real estate brokers and/or salespersons. Lawyers hiring Real Estate Licensees and Supervising Licensees as Legal Assistants, Paralegals, or some other sort of legal office personnel. Lawyers as ‘in-house’ counsel in real estate companies. Is the business model simply an unlawful scheme to circumvent the prohibition against the collection of advance fees by a real estate licensee after the recordation of a NOD? Is the lawyer actually performing legal services and providing a valuable service to individual clients? 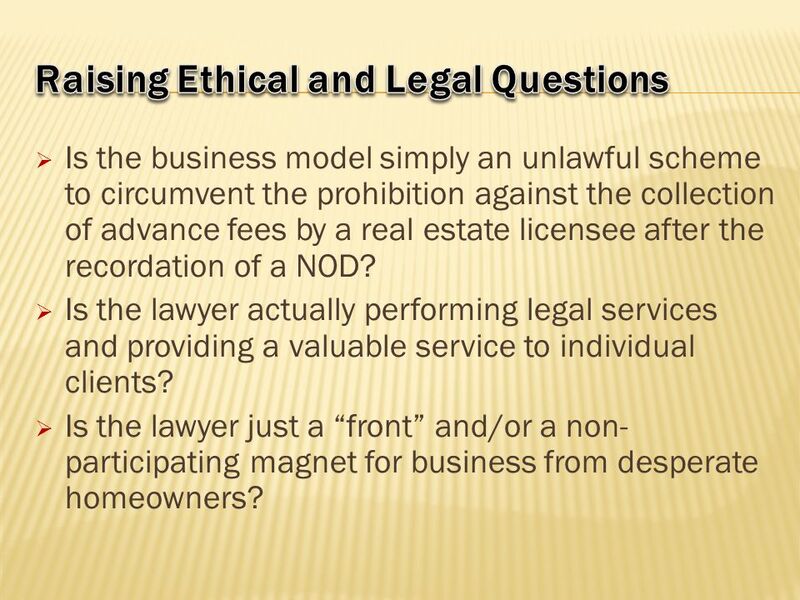 Is the lawyer just a “front” and/or a non-participating magnet for business from desperate homeowners? Is the real estate licensee who is working with the lawyer a real estate “salesperson” engaged in real estate licensed activity? 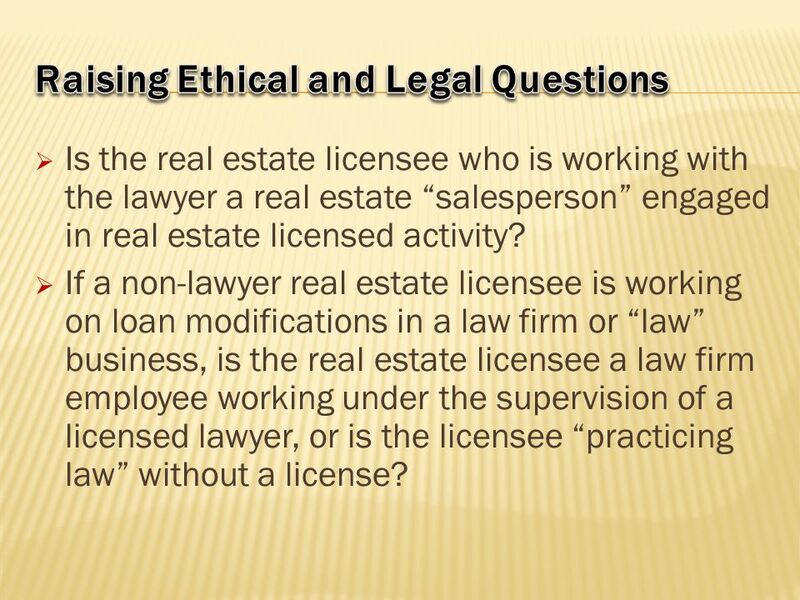 If a non-lawyer real estate licensee is working on loan modifications in a law firm or “law” business, is the real estate licensee a law firm employee working under the supervision of a licensed lawyer, or is the licensee “practicing law” without a license? 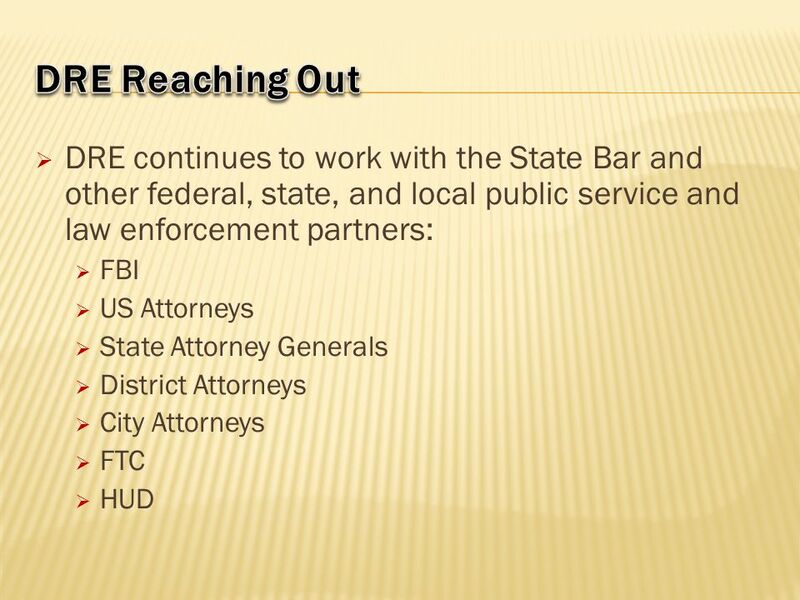 9 DRE Reaching Out Results of Outreach State Bar now actively investigating hundreds of cases where lawyers are involved in the loan modification and foreclosure rescue business. Many cases also involve real estate licensees. 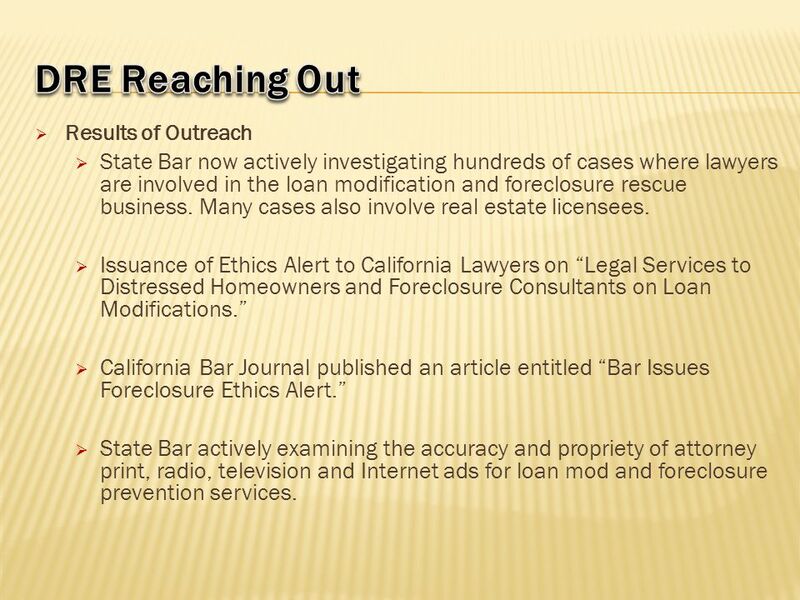 Issuance of Ethics Alert to California Lawyers on “Legal Services to Distressed Homeowners and Foreclosure Consultants on Loan Modifications.” California Bar Journal published an article entitled “Bar Issues Foreclosure Ethics Alert.” State Bar actively examining the accuracy and propriety of attorney print, radio, television and Internet ads for loan mod and foreclosure prevention services. 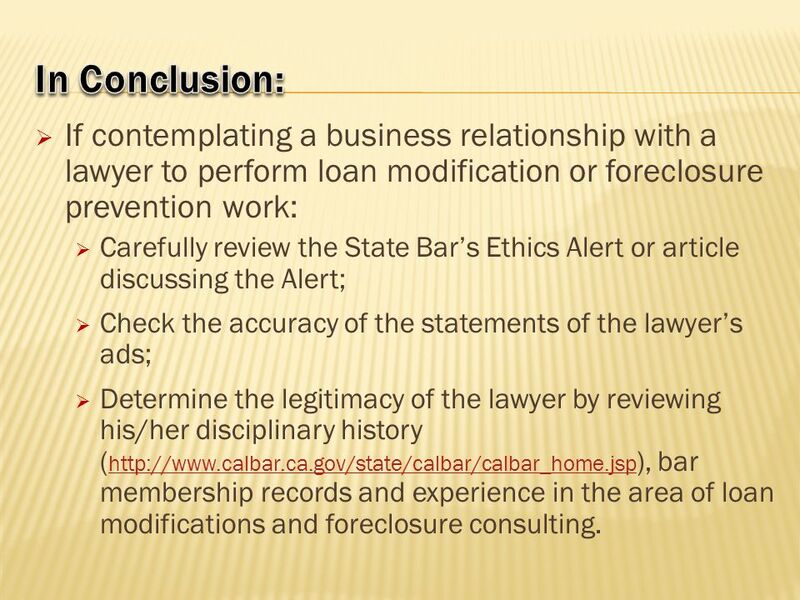 11 In Conclusion: If contemplating a business relationship with a lawyer to perform loan modification or foreclosure prevention work: Carefully review the State Bar’s Ethics Alert or article discussing the Alert; Check the accuracy of the statements of the lawyer’s ads; Determine the legitimacy of the lawyer by reviewing his/her disciplinary history ( bar membership records and experience in the area of loan modifications and foreclosure consulting. 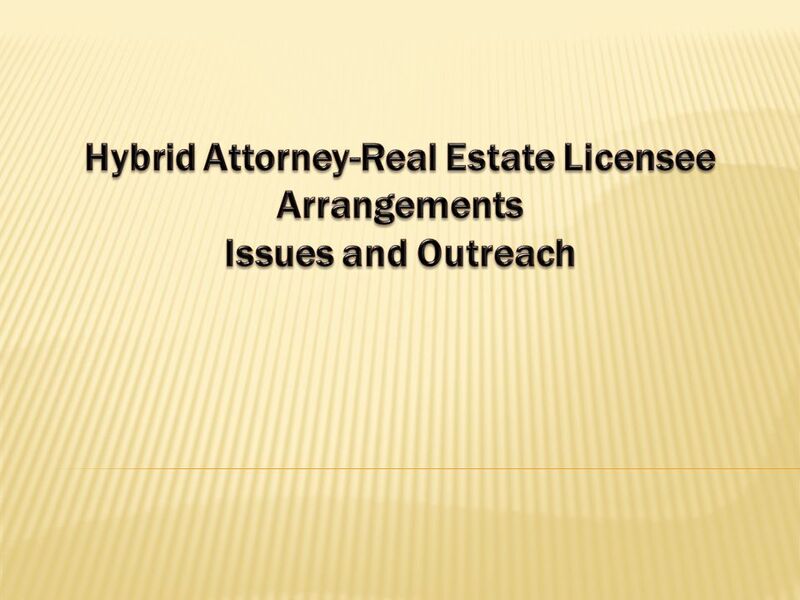 Download ppt "Hybrid Attorney-Real Estate Licensee Arrangements Issues and Outreach"
TITLE 101 Introduction A real estate investment is substantial, perhaps your clients largest outlay of money, and therefore, the largest risk. A real estate. The PERE Real Estate CFOs Forum Regulation Coming? October 7, 2009 New York R. Eric Emrich Chief Financial Officer Lubert-Adler Partners, LP. November 19, Employment and Recruitment 2. Non-Discrimination Notice 3. Sexual Harassment 4. Criminal Background Check 5. Child Abuse and Neglect. When Things Go Wrong… International Conference of Regulators Sept. 28, 2012 Jayne Kim, Chief Trial Counsel of the State Bar of California. American Bar Association Ethics 20/20 Commission Presentation to YLD Council Las Vegas, May 12, 2011 Professor Paul D. Paton, Reporter. C O A L I T I O N C O R N E R Coalition Corner: Business training tools for HR staff, real estate licensees and other service professionals in the relocation. Housing Presentation November 16, 2005 Pete Cantrell, Attorney. Residential Mortgage Fraud Enforcement: Trends and Identifying Schemes Gary Crabtree, SRA Affiliated Appraisers Bakersfield, CA. Virginia Foreclosure Prevention Task Force The Foreclosure Crisis: A Regional Perspective June 19, 2008 Presented by: Bill Shelton, Director Virginia Department. Chapter Four Conflicts of Interest In this chapter, you will learn about: Rules governing conflicts involving clients, including simultaneous and successive. Week 4. Recognizing the Ethical Issue  Many “ethical issues” turn into “ethical problems” (and sometimes “ethical nightmares”) because they go unnoticed. Division of Finance and Corporate Securities 1 Financial Predatory Practices Diane Childs Financial Information Outreach Coordinator. A FOCUS ON CONSUMER PROTECTION. Purpose of the Advance Fee Law Legislation created in the 1950’s To ensure brokers perform the services promised for the. Week Duty to keep quiet, not talk about cases By product of Fiduciary Duty 2. Right not to be forced to testify about communications --Statutory. LITIGATION MANAGEMENT – Effective Cost Containment 2002 Conference Branson, Missouri. Thomson/South-Western©2008 Chapter 18 Licensing Laws and Professional Affiliation _______________________________________.